Antwerp: J.B. Vrients, Latin text edition. Miniature map of the Polish-Lithuanian Commonwealth, stretching from the Baltic to the Black Sea. London: Chapman and Hall, 1834. Map of the Baltic States controlled by Russia, including Estonia, Latvia and northern Lithuania. Amsterdam, 1616. A charming miniature map. Hondius engraved new plates for his edition of the Bertius atlas 'Tabularum Geographicarum Contractarum', which he sold alongside the Mercator 'Atlas Minor'. Paris, c.1692. The Polish Commonwealth at its zenith, with Lithuania and Ukraine, engraved by A. de Winter for the quarto edition of Sanson's atlas. Nuremburg, 1718. With a large allegorical title cartouche. London, 1781. Apparently 'Engraved (by the King's Authority) for the Geographical Dictionary'. London, 1814. A colourful map of Eastern Poland with parts of Lithuania. Edinburgh, c.1817. Map of northern Poland. Antwerp, 1584. North-east Poland from Gdansk east to the borders of Lithuania, including Kalingrad, now part of Russia. The first issue of this map, published in the Appendix of 1584. London, 1759. 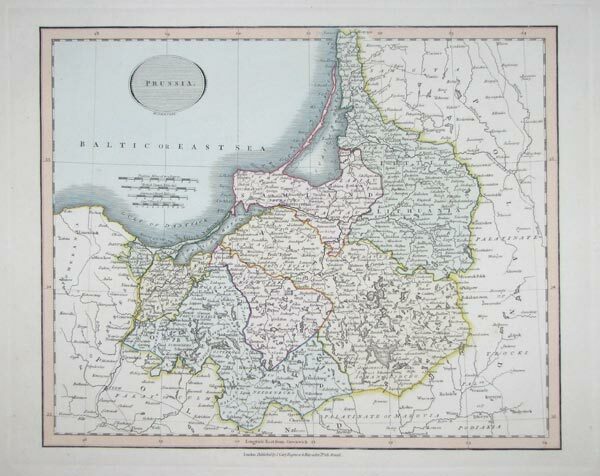 Map of Silesia in Poland, centred on Wroclaw, 'Engraved (by the King's Authority' for the Geographical Dictionary'.